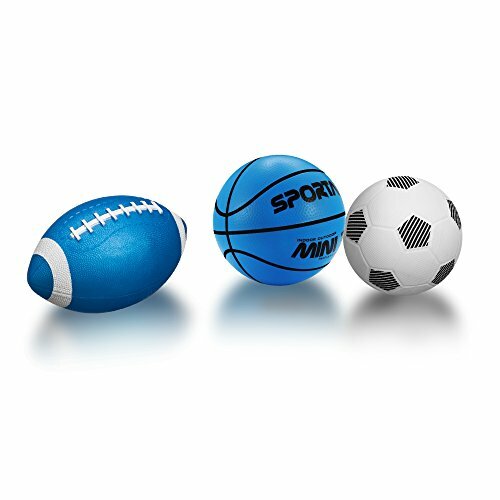 ❤ INCLUDES 3 balls - 5 inch basketball,5 inch soccer, and 8.5 inch football. Great size for small hands, recommended for age 3+. ❤ PARENTS RELAXED - Durable inflate construction, cute balls and bright colors make kids long time playing and fondle admiringly. Parents finally can rest assured to relax or do something for yourselves for a while. ❤ BRIGHT COLOR FOR KIDS - Bounce great, real feeling of a traditional basketball. Toysmith offers toys for any kind of play: active play, science and discovery, arts and crafts, impulse and novelty toys, and nostalgic retro classics. ❤ GOOD QUALITY AND WONDERFUL GUARANTEE - We want you are satisfied with our products, so you can buy with confidence! If our product doesn't 100% satisfy your expectations, we will give you a full refund. If you have any questions about this product by SportAI, contact us by completing and submitting the form below. If you are looking for a specif part number, please include it with your message.